Who says making cheesecake has to be a long and stressful process – just make cheesecake stuffed strawberries! Hmm…cheesecake? Be still my heart! Instead of simply putting chocolate covered strawberries on cheesecake, why not stuff the cheesecake into the chocolate covered strawberries? It’s a bit more romantic that way, no? Plus I love that you don’t have to be extremely careful in having to bake a cheesecake that you don’t want to crack. Enter this cheesecake stuffed strawberries recipe. 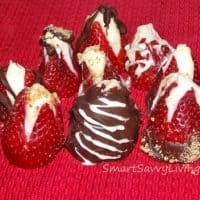 Either way, whether you make these cheesecake stuffed strawberries as a treat for yourself or to share with your sweetie this Valentine’s Day (I think they’d also be a great dessert for cookout season), they are sure to be loved. The boyfriend may or may not have loved these so much that he ate, oh, maybe 10 or 15 in one sitting (to be fair, I had my fair share as well – it’s part of recipe testing, right? …right?). Honestly, since he’s not much of a sweets fan, I didn’t expect him to like them so much, though thanks to the fruit they aren’t that overly sweet. With a touch of chocolate and a yummy cheesecake center, they make the perfectly romantic light, yet decadent, dessert. 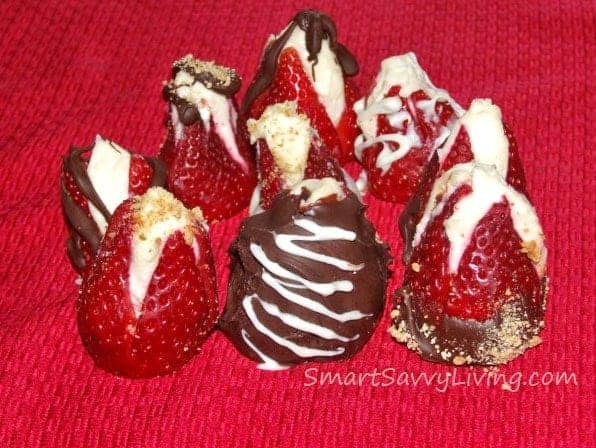 As always, you can change up the cheesecake stuffed strawberries to your liking. While I used vanilla for the cheesecake flavoring, I think it would also be great with almond extract, or you could even add a bit of melted chocolate for a double chocolate whammy – yum! You could also opt to not dip these in chocolate at all or not use any toppings. I just used some graham cracker crumbs as a topping on some for the full cheesecake effect, but you could also use coconut, nuts, other cookie crumbs, etc. Note that for this cheesecake stuffed strawberries recipe you can also opt to cut off the top of the strawberry and use a paring knife to hollow out the center and fill that way. However, I wanted to be able to stand the berries up without cutting off more of the berry, so I opted to just make an x cut not quite all the way through starting at the small tip end. Various other toppings such as chopped nuts, coconut, cookie crumbs, etc. Wash strawberries and cut off the green leafy portion. You could leave them on if you wanted, but mine looked rather dry and unappealing. Let dry while making the filling. Place cream cheese in medium-sized bowl with sugar and beat until smooth and creamy. Mix in extract and salt. Taste for sweetness, adding in more sugar if desired and then set aside. Take a paring knife and carefully cut twice into each strawberry starting at the small tip side without going all the way through into an X shape. You can alternatively choose to take a pairing knife and hollow out the center. I prefer the first method as it allows the strawberries to stand without cutting more of the berry off. Place cream cheese filling into piping bag fitted with tip of your choice. You can also use a plastic baggie and squeeze into one bottom corner, twist the baggie and cut off a very small portion of the corner. Steadily pipe the filling into the strawberries - you can choose to just fill or add filling to the top of the berry. Melt chocolate(s) - I used semi-sweet and white and make graham cracker crumbs if needed. Dip berries into chocolate, or drizzle, etc. and sprinkle with graham cracker crumbs. I dipped some, drizzled some, made others without chocolate, etc. to have all kinds of looks like a traditional box of chocolates. I hope you enjoyed this Cheesecake Stuffed Strawberries as much as we did – be sure to check out our other recipes! This is absolutely mouth-watering. Love to try this with the kids.